There is evidence of settlement in Canons since Roman times, but the history of this estate really began when James Brydges, later to become the first Duke of Chandos, acquired a huge tract of land in the Parish of Little Stanmore in 1713. It was known as The Canons Estate. As Paymaster General, he was keen to show off his new-found power and wealth by building a fine mansion on the land. He went on to develop a grand park and garden in the 1720s but then the second Duke lost all his money in the South Sea Bubble scandal and the house was dismantled as part of the disposal of his estate in the 1750s. 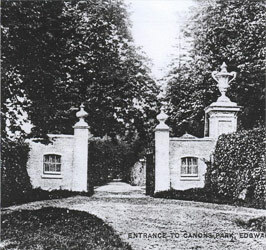 The Gate Piers at the entrance to Canons Drive are the only surviving remnants of that house. Canons Drive was originally called 'The Avenue' and the English native trees at the beginning of the road date back to the first planting of the Avenue. In time, a more modest - but still beautiful - mansion was built on the old foundations by William Hallett, a successful cabinetmaker, and the huge Wellingtonia trees that line the upper part of Canons Drive were planted during this period. The new house repeatedly changed hands during the 18th and 19th centuries until eventually the whole estate was sold off to cover the debts of Sir Arthur du Cros (see article, below), the last private owner of Canons Mansion. North London Collegiate School purchased the house, which is now the central building of their campus. Harrow Council purchased some of the remaining land to form Canons Park, whilst other areas were used for housing, sports grounds and railway land. The Canons Park Estate (or 'Canons Drive Estate' as it is more familiarly known) was created during the late 1920s and early '30s on land purchased from the sale of the Canons Estate. It comprises around 340 houses and 66 flats. The majority of the houses were built in typical 'Black & White' style but there are also Arts & Crafts, Art Deco and more modern styles of architecture to be found. Two of the most beautiful areas of the Estate are the 'Basin Lake', and the 'Seven Acre Lake' - a private lake that is only accessible to CPEL members. 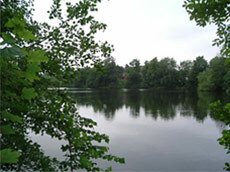 Seven Acre Lake. 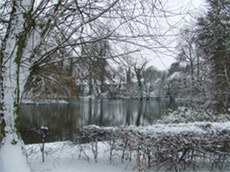 The Basin Lake (duck pond) in Canons Drive, winter 2009/10. The Basin was created as an ornamental pond that carriages had to drive around when they entered the 'Avenue', giving them their first glimpse of the mansion in the distance. For some years now, the Estate has been listed as one of Harrow Council's conservation areas, which means that the appearance and maintenance of the houses and streets is strictly controlled, as are the trees and grass verges. Surplus Land (Canons) Ltd owns the Gate Piers at the entrance to Canons Drive, the house-side grass verges along Canons Drive, the magnificent redwood trees that line Canons Drive, the Basin Lake and the Seven Acre Lake. These features were given to the residents, to be managed by the Canons Park Estate Association (CPEA), now the CPEL (Canons Park Estate Limited) and are also listed by English Heritage. Membership of the CPEL is by voluntary subscription and is open to all householders on the Estate. At some point after 1720, James Brydges, the first Duke of Chandos, spent £1,630 'making the ground, with a large basin, two ponds, and planting' in Canons Drive, and a further £275 on 'two large stone pillars with supporters'. These still stand at the entrance to Canons Drive. This was a phenomenal sum (around £234,000 in modern money) and far more than the typical worker might ever hope to earn in a lifetime! All in all, the Duke's personal fortune before losing much of it in the South Sea Bubble of 1721, may have amounted to as much as £712,000 (£102 million), making him one of the wealthiest men in the country. Many have wondered at the sources of Chandos' fortune, and concluded that it was probably derived from his office as Paymaster of the Forces Abroad between 1705 and 1713. During this period, Britain and her allies � led by the Duke of Marlborough � had deployed armies across Europe to oppose King Louis XIV of France in the War of the Spanish Succession. Chandos handled the money for them all. Every penny for the allied armies went through his hands, some £23.8 million (£3.4 billion) over his eight years there. 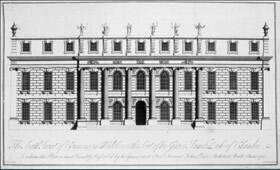 Unsurprisingly, the office was a byword for corruption, and for a long time the suspicion was that Chandos had similarly enriched himself at the country's expense, and used this to fund his extravagant spending at Canons, the magnificent mansion and grounds that he created between 1712 and 1720, employing the top craftsmen and garden designers of his day. Since the 1950s, more extensive research into Chandos' papers � now held at the Huntington Library in California � have shown the techniques he used. Perhaps the most harmless was to engage in what would be today called insider trading. Taking advantage of his close official links to the Duke of Marlborough, Chandos was informed early on of their plans for military campaigns abroad. His particular contact was Major-General William Cadogan, a fellow old boy of Westminster School and Marlborough's chief of staff. Using this information, Chandos would place bets on the London markets that certain towns would fall by certain dates; for instance, by June 1706 he had £3,500 (£503,000) invested, and stood to lose £1,200 (£173,000) if the town of Charleroi fell after July. In this case it did not, but it is clear that Chandos occasionally profited, and his winnings no doubt contributed towards the growth of his fortune. 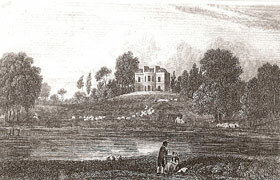 The existing Canons Mansion, now North London Collegiate School, illustrated in the early 1800s. Cadogan assisted by convincing the troops to accept this foreign gold coin, and by introducing Chandos' agent to a merchant who could supply large quantities of it. In 1707 alone, Chandos made over £2,000 (£288,000) and Cadogan even more. However, anaylsing Chandos' correspondence at the Huntington Library in California, provides some discoveries that turns these accusations on their head. It is true that Chandos was accepting large percentages from the money he handled but the context in which he was operating needs to be taken into account. The remittance of money was a slow business, mainly because it had to be drawn as foreign currency on overseas banks through cumbersome instruments called 'bills of exchange'. In modern terms, Chandos was running the entire war effort out of his current account, remitting money abroad by banking cheques in Amsterdam or Lisbon that might take up to two months to clear. As a result, there was a dangerous risk that Marlborough's army would run short of pay in Flanders and might mutiny, even if the money was technically available and in the system. As a result, Chandos appears to have approached the troops abroad with an offer they couldn't refuse. In return for a percentage, he was prepared to guarantee that the regiments would receive their pay on time - using his own money if necessary to make up the difference - until he finally received the real money from the Treasury. That percentage covered the risks he ran, the costs of borrowing money from his bankers in London and abroad, and a fee for the tricky financial footwork that all this involved. Although it may be an exaggeration to say that Chandos single-handedly won the war for Britain, there can be no doubt that he played an important part. It is true that he exploited his position to make money on the side, but in the big picture these sins were relatively minor: what was �2,000, after all, when millions were being spent on the war each year? Moreover, far from damaging the war effort, by injecting liquidity into the financial system at his own personal risk he helped keep Marlborough's armies afloat. What he did was technically corrupt, but also necessary for national survival. Sadly, the original Canons Mansion was dismantled and many of its outstanding features and treasures were sold off and scattered throughout Britain. The lands, trees and lakes of the Canons Park Estate, Canons Park and the grounds of North London Collegiate are all that remain to remind us of the glory days of the Duke of Chandos � and how his greed and corruption, though reprehensible, may have helped Britain to defeat its enemies. © 2010 Aaron Graham, who is studying for a doctorate in History at New College, Oxford and researching into the funding of the British army in the 18th century. As a resident of the Canons Park Estate it was entirely coincidental that his research led him to the activities of James Brydges, the first Duke of Chandos, who created the Canons Estate and built the original mansion on the site now occupied by North London Collegiate School. How many of us have walked along Du Cros Drive in Stanmore unaware of the colourful character who gave his name to the road? Sir Arthur Du Cros (1871 - 1955) was a stereotypical Edwardian gentleman - racing cyclist, car enthusiast, supporter of the military use of aviation, philanthropist and successful businessman. He made his money as Managing Director of the Dunlop Pneumatic Tyre Company, and founder of the Dunlop Rubber Company, and so wealthy was he that during the First World War he personally paid for three ambulance convoys. 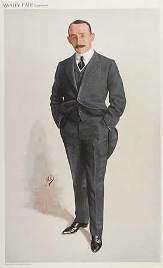 In 1908 he was elected Conservative MP for Hastings, which he continued to represent until 1918. He was seen as an opponent of the suffragettes, who were very active at the time, so they actually burned down his house in Hastings as a protest. He purchased Canons, in Stanmore, in the 1890s. In 1914 he employed C.E.Mallows, the famous Arts and Crafts architect, to redesign the gardens and part of the exterior of the house, and the garden he created, comprising the North and South terraces, was seen as one of the greatest of the Edwardian era, and influenced such well-known garden designers as Gertrude Jekyll. Arthur Du Cros mixed in the highest social circles. He put Craigweil, his house in Bognor, at the disposal of George V in 1929, and earned the town the exalted name of Bognor Regis. He was a friend of Frances, Countess of Warwick, to whom he lent £60,000, writing the loan off when she fell on hard times. She was one of Edward VII's mistresses when he was Prince of Wales, and when she threatened to publish the personal letters that the Prince had sent her, Du Cros was charged with avoiding her blackmailing the Royal Family. Du Cros himself was married three times. His first marriage to Maude Gooding ended in a rather scandalous divorce in 1923, after he left her and their children. When she asked him to return home he wrote to her to say that 'it will be quite impossible to ever resume this life of misery which is ruinous to health and to all feelings of dignity and self-respect'. He was then married and widowed twice before his own death at his home, Nancy Downs House, in Oxhey, Watford, in 1955. From the 1920s, Du Cros suffered a series of financial disasters and so put Canons up for sale. It was bought in 1929 by North London Collegiate School, who were looking for a new site to enable them to move from Camden Town. Ironically North London Collegiate School had been founded in 1850 by Miss Buss for the specific purpose of giving girls the same academic education as their brothers, and many old girls and Head Mistresses had supported the suffrage movement which Du Cros was so against. The remainder of the Estate was divided up into various parts; one of the two largest areas - the formal gardens near the house and the open land that it overlooked - was purchased by Harrow Council and became Canons Park. Much of the remaining land, including a seven-acre lake and a smaller lake, was sold to various developers to create the Canons Park Estate, which was constructed during the 1930s and comprises around 320 houses. 76 Chenies Mews, London WC1E 6HX The society aims to advance education by promoting the study and appreciation of, and supporting and publishing research on, the music and life of George Frideric Handel and his contemporaries.